It seems that every year, I end up doing at least one pomegranate-oriented embroidery project! Why is that?! Well, this time, I’m using this embroidery pattern, and will be showing you the project step-by-step, so that you’re welcome to stitch a long if you like. To start, I printed four copies of the pomegranate corner pattern, cut out the corner designs, lined them up on graph paper to make sure they were square, and taped them down, ready to trace. 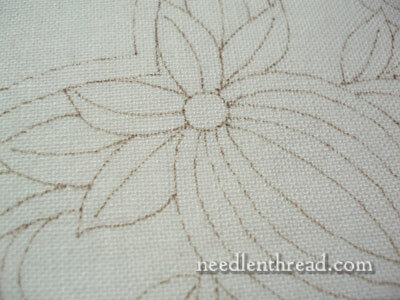 For linen, I’m using Alba Maxima, a Legacy linen, which is a nice weight for wool embroidery. I thought about using twill, but there’s a chance I may incorporate a drawn thread bit either around the outside, or on the inside – we shall see! The idea is floating there, so I thought it best to stick with a linen that would be suitable in case I do end up drawing some threads out. I’d go with a piece of linen about 15″ square, or maybe even slightly larger – it all depends on how you want to use your finished piece. You can transfer the embroidery design using any design transfer method you prefer. I traced the design using a “moonstone” colored Martha Stewart craft pen (permanent, archival quality and so forth), which you can pick up at Michael’s. You can also use a sepia colored micron pen to very good effect for this type of project. Sepia or light brownish ink are more preferable, over black ink. The color will blend better and the tracing lines will be less visible – in fact, they should be invisible – when the embroidery is complete. The design gives some good “scope” for some fun stitching, as well as a few focal points for learning certain techniques that might seem a little daunting to beginner or novice stitchers (like nice satin stitch circles, for example). There’ll be a little bit of long and short stitch shading going on, too. As far as wool is concerned, I’m awaiting some supplies right now, and I’ll let you know what threads I’m going to use once I receive them and have a chance to go through them. I may use a combination of wools, as I did on the Crewel Rooster project last year, or I may stick with one wool for the whole piece. I’ll know that better when I have those supplies on hand! 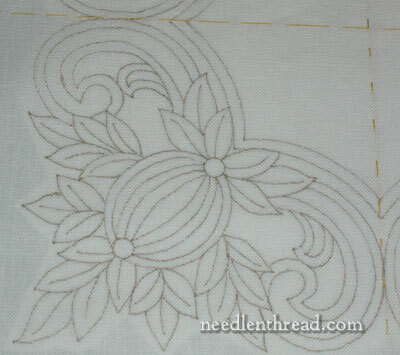 I’ll also be highlighting some instructional resources that will help with the project – in fact, tomorrow, I’m reviewing the RSN Crewel Embroidery book that recently came out, which I think would make a nice reference to have on hand for this project. Well, more on that tomorrow! So, if you’re interested in following along, in stitching the same piece along with me, you are quite welcome to do so… or you can just sit back and watch it unfold. Whatever the case, there will be a permanent directory for this project, so that you can come back to it later if you want! Questions, comments, suggestions? Feel free to leave a comment! If I could I’d prefer to do something (?) with separate corners, could I? I’ve never used wool for embroidering and this pattern (with four corners together) seems to me too heavy worked in wool threads – is this a foolish think from an ignorant?? Hi, Meri – Sure, you can definitely separate the corners. I just like the way the corners come together and set off the center, and I prefer a smaller finished piece. The piece won’t be “solid” wool embroidery. Some of those lines have spaces between. Crewel weight wool thread is also rather fine – it isn’t a thick heavy wool. Hi, Asha – yes, it’s the supplies that are generally more difficult to come by. I’ll post a complete supply list, once I make final decisions on the threads! Look forward to seeing this project unfold. I might enjoy doing this someday when I have the time but more importantly the supplies. I adore symmetry but will you find it difficult to do the design over and over again (same thing 4 times)? I would struggle with the stitches being quite even and the same in all 4 corners. Shoot: I’m working on an Ink Circles design right now and it’s 7 motifs, not identical but similar and they’re driving me bonkers. You must have a lot more patience than I do. Hi, Mary. A little note to tell you that I just bought the RSN Crewel book and, while it’s nice to have another reference and other methods presented (especially for transferring), I think your site is better for clarity and depth of instruction. I will be using you and your site as a reference for my EGA crewelwork. Thanks again! I am just a beginner when it comes to embroidery and can’t wait to see what you will do with this design. I found your site by googling sunbonnet sue & found one you had done awhile back. Your work is beautiful & I keep coming back to look & learn. I’m a quilter, mostly, but do many different hand stitching. This latest project of yours is going to be worth watching. 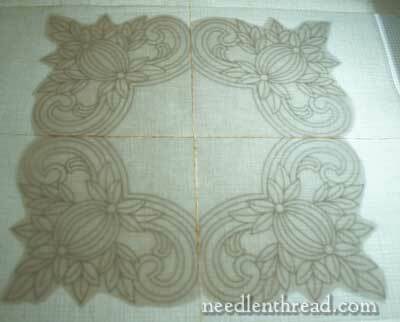 I was looking through Nordic Needle site the other day for threads to use in place of wool. You mentioned peral 8 and 12… would Nordic Needles line of Brazilian Embroidery by Edmar work too? They seem to be 100% Rayon.. the Glory and Iris ones, or are those too fine? Could use your thread knowledge with this. I am only starting to branch out to new areas of embroidery and have all the DMC flosses with a couple peral 8 and 12s in ecru and white. I am so excited about doing this project. I’m looking forward to seeing how the project develops! Wow, Fine d’Aubusson which is readily available to me here in France! I too desire to start the project with you…..i have white cotton tablecloth …am thinking to start on it…i just relocated to UK from India and not much sure of shops here..i only have embroidery floss that i brought with me from India. I havent worked with any other thread. Would I be able to do it with embroidery floss. I am excited about this project. I eagerly look forward every day to your newsletter, especially to see if you have made any progress with the pomegranate project!! I have decided to try this project with you, even though I am a beginner. I will be using Linen purchased from a Fabric Chain store, and DMC floss. Thank you for your wonderful website and daily Newsletter. I love it!! How many of each thread color should I order for the Pomegranate Corner project? I’m working with one of each color at the moment. I will probably have to get a couple of each skein of the “medium” shade ranges in the green. (2131, 2132), because the leaves take up more thread than I realized (especially because I’ve been “testing” and picking out). The other colors are definitely one-offs. Hi Mary, very beautiful all the projects that we share in your page. The explanations are very thorough. Many thanks for your generosity and good hearts, to teach many techniques Bordado.Dios Bless and Hugs from Bogotá Colombia.